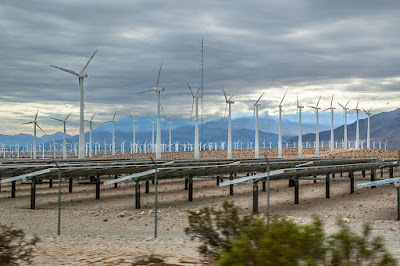 One good thing about touring the wind farms in Palm Springs on the coldest, greyest day I've ever experienced here, was that the wind was blowing. 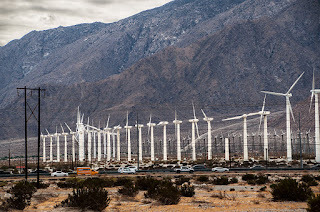 Nearly four thousand windmills used to line the San Gorgonio Pass north of Palm Springs at the entrance to the Coachella Valley – now they total about two thousand. Here the Santa Rosa and San Bernardino Mountains squeeze the prevailing westerly winds through a funnel. It's a perfect place for a wind farm, if unattractive. 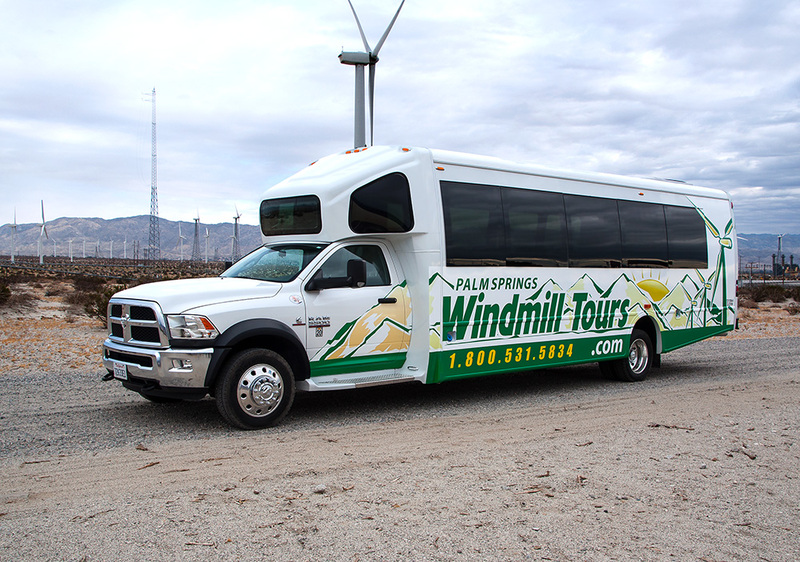 Windmill Tours are the only company to provide tours and they have gained rights to entry on the privately-held land. 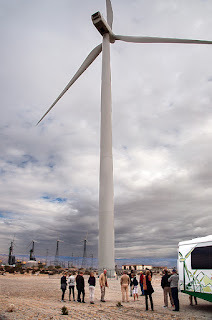 We saw everything during the hour and a half visit, starting with a visit to an outdoor display of the older windmills' parts, which gave me a clearer idea of how they worked and how they are now controlled, and a drive all over the site. We also learned about the need for two natural gas plants for periods of peak consumption when there's no wind (rarely!). Tour reservations must be made online and the tour costs USD$47.00 per person. Today modern wind turbines are replacing the Vestas (older versions) and are needed in fewer numbers. However they need more space. 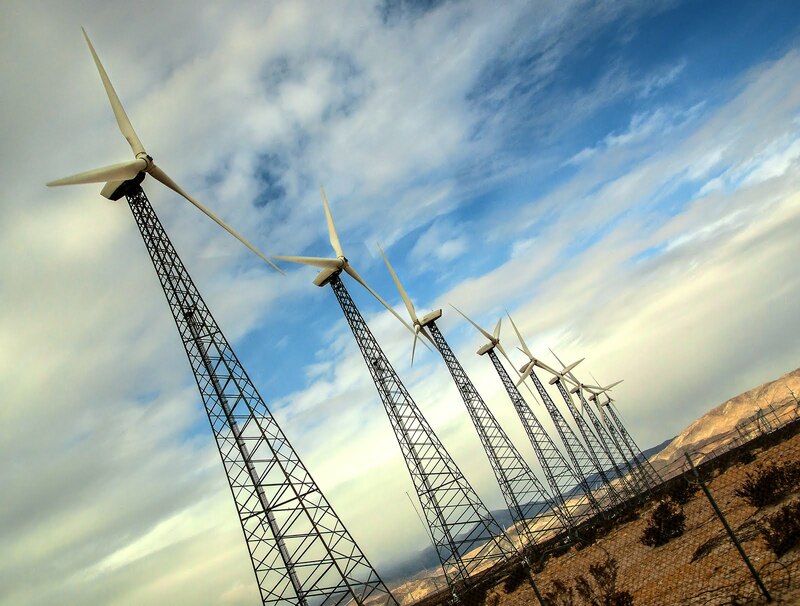 They are gigantic – 420 feet tall with a nacelle the size of a semi-truck and blades over 130 feet long – and each can deliver 3 megawatts of electricity per day in ideal conditions. The nacelle provides the controls to capture the wind, change the pitch of the blades, a gearbox, and a braking mechanism. I was amazed at their size and cost. 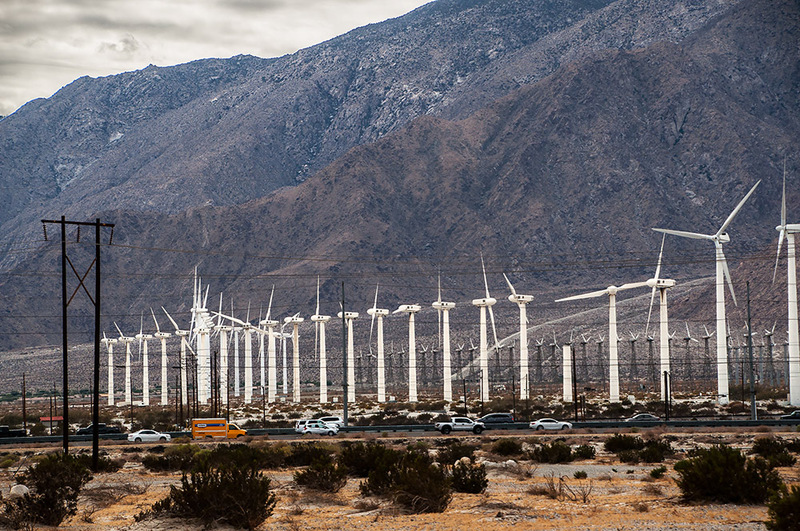 The total electricity produced by the windmills in the San Gorgonio pass is about 1822 gigawatts annually. It equates to the amount of energy used by 180,000 typical US homes in one year. 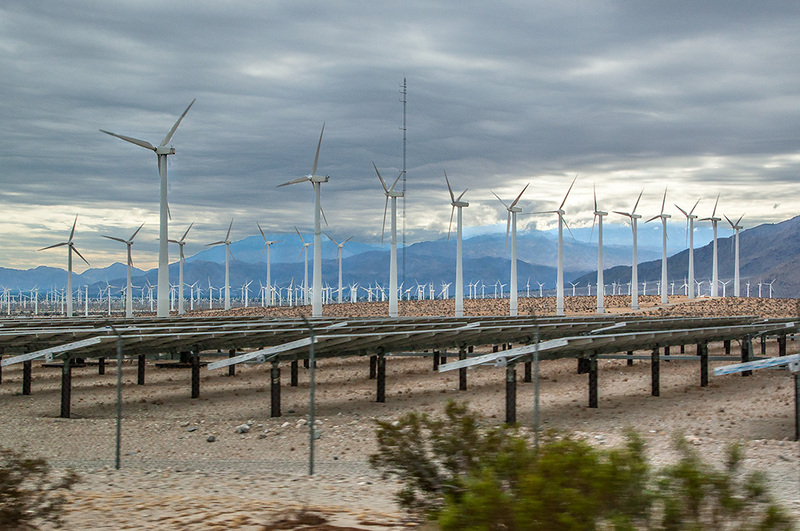 As land is cleared of the older windmills, solar panels are filling the empty spaces between the modern monsters; they are computer controlled too and turn to face the sun on its journey from east to west. Overall, this was a good tour especially for engineers and those interested in alternate power generation. The weather proved challenging for photography and for staying warm outside. Few participants had cold weather gear in Palm Springs! Images: © Photos by Pharos 2015. All rights reserved. Vancouver-based Julie H. Ferguson is an addicted traveler who is intensely interested in the history and culture of foreign lands, as well as Canada, and her stories and images reflect this focus. Julie never leaves home without her cameras and voice recorder, always looking for the colour and sounds that captivate readers everywhere. 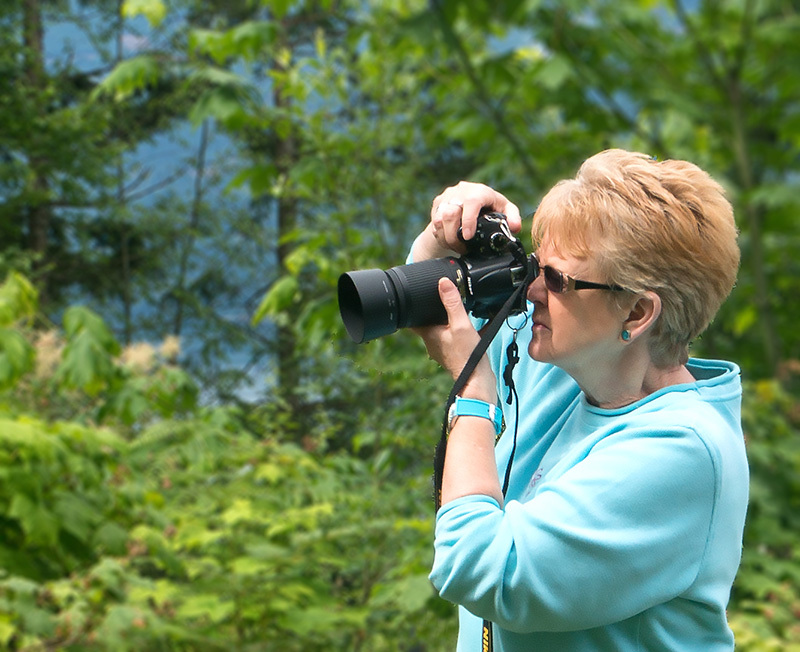 A non-fiction writer for 45 years and an avid photographer, Julie is also the author of twenty-four books, including four about Canadian history and eighteen photo portfolios. Her articles and images have appeared in national and international markets, both print and online. Member: The BC Association of Travel Writers, and formerly the International Travel Writers Alliance and the Federation of BC Writers. 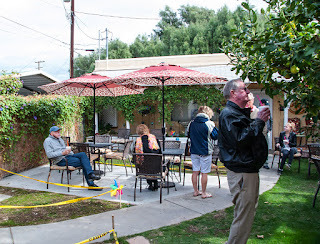 Copyright © Julie H. Ferguson and Photos by Pharos. All rights reserved.. Theme images by Sookhee Lee. Powered by Blogger.